Have the students meet in a computer lab where each pair of students (or each student) has a computer. It is probably good if students work in pairs. Hand out the questions on paper. Tell the students which question numbers you want them to try to answer, and how much time they have. Having students work in pairs is probably good. You may wish to tell them to skip questions they get stuck on. 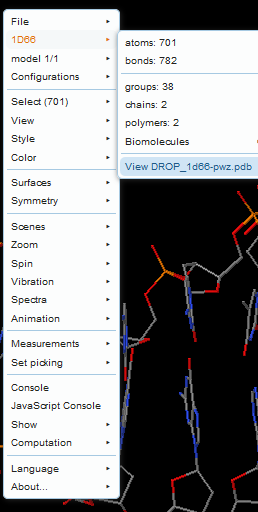 Explain that they are to use the interactive molecular graphics to help answer the questions. After the announced time, hand out the answers, and have each pair grade another pair's answers. Encourage discussion between the groups. Question 17 (within Set B) has a meaning and can be answered only when the tutorial uses one out of two DNA models available for this tutorial. The web author or the instructor can decide which one is being shown, by means of a simple edition of one of the files. Detailed explanation. Answers to the Questions are available to teaching faculty who inquire with an email to Eric Martz providing evidence of their faculty positions, such as by reference to a school or college website listing faculty. Two alternative models of DNA are offered in this tutorial. 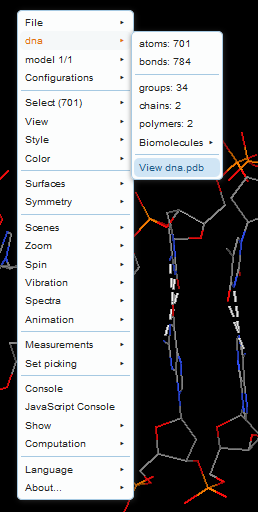 You can check which one is being used by opening the pop-up menu in Jmol (right-click, or click on Jmol logo at the bottom-right corner of the applet) and looking at the top-most entry, which will be either 1D66 or dna. (a) The classical 1d66-pwz.pdb (modified by Eric Martz from 1d66.pdb, for the old DNA tutorial that uses Chime). This has an error in C28, whose base is flipped so that the wrong side faces the complementary G11. Using Jmol capabilities, long H bonds are drawn to the correct atoms, in C28 and G11, which are far away in the model; the resulting, abnormally long, H bonds are similar to those automatically drawn by Chime. Martz took advantage of this anomaly for setting one of the student questions (#17). To use this model: open the file utils.js using a plain text editor and, near line 29, remove the two slashes (//) before var DNAmodel = "1d66-pwz.pdb" and add two slashes before var DNAmodel = "dna.pdb". Save the changes and reload the tutorial page. (b) A new dna.pdb (modified by Angel Herráez from 1d66-pwz.pdb) with corrected position of C28, that forms normal Watson-Crick H bonds in Jmol. Student question #17 has no sense in this model and cannot be answered. To use this model: open the file utils.js using a plain text editor and, near line 29, add two slashes (//) before var DNAmodel = "1d66-pwz.pdb" and remove the two slashes before var DNAmodel = "dna.pdb". Save the changes and reload the tutorial page.